“SAINT (Social Action in North Tyneside) works with groups of like-minded volunteers to create meaningful social action projects that have an impact on the local community. Our newest SAINT project has been created by a small team of volunteers who are keen to build ‘Little Free Libraries’ and install them at two locations in North Tyneside. 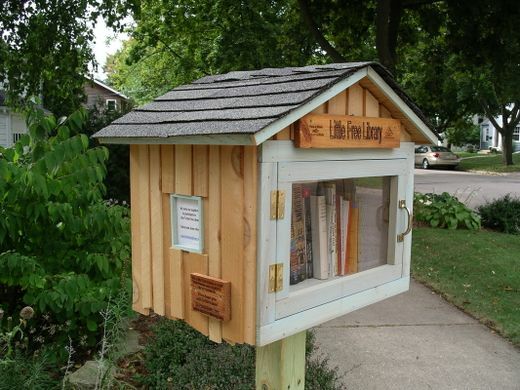 Little Free Library is a not-for-profit organisation that inspires a love of reading, builds community, and sparks creativity by fostering neighbourhood book exchanges around the world. You can check out their website at www.littlefreelibrary.org. SAINT staff will support both projects from start to finish with a little bit of funding, materials and knowledge of the local area. Volunteers are taking charge of designing, building, decorating, installing and filling the Little Free libraries but they need more people to help make their projects happen. So far SAINT has gained permission for the installation of the libraries with our friends at Meadow Well Connected in North Shields and The Rising Sun Country Park in Benton. We think these are the perfect locations for encouraging people to access free books, share and spend some time with loved ones over a good book. The library at Meadow Well will primarily focus on providing a free place to access children’s books and will also include ‘random acts of kindness’ for each child to complete in return for lending the book. The Rising Sun Country Park Library will focus on books on the topics of nature, local history and wildlife. These will run as two separate projects where volunteers can take charge of their Little Free Library from start to finish. Our two host venues have also kindly offered us access to free building space and tools. Someone with a little bit of woodwork knowledge for the Benton library that can keep us right! Bookworms who might like to support us to fill both libraries with children’s, history and nature themed books. Contact Josie Robinson at VODA for more information. Thank you for your booking: Volunteers wanted to help create Little Free Libraries in North Tyneside. We will be in touch soon to confirm your place.